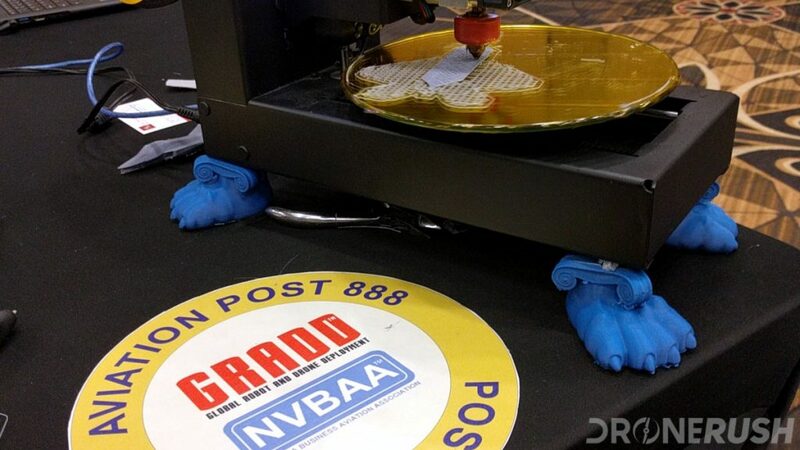 We had a lot of fun at InterDrone 2017 in Las Vegas. This was an event that explored drones of all shapes and sizes, spanning the consumer market up to some major commercial applications. 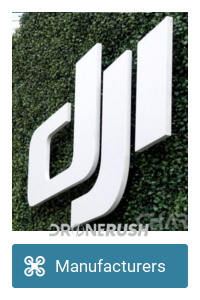 We’d say that the show was a little more than half focused on the commercial market, nearly half on the professional market and the remaining focus on consumer drones. 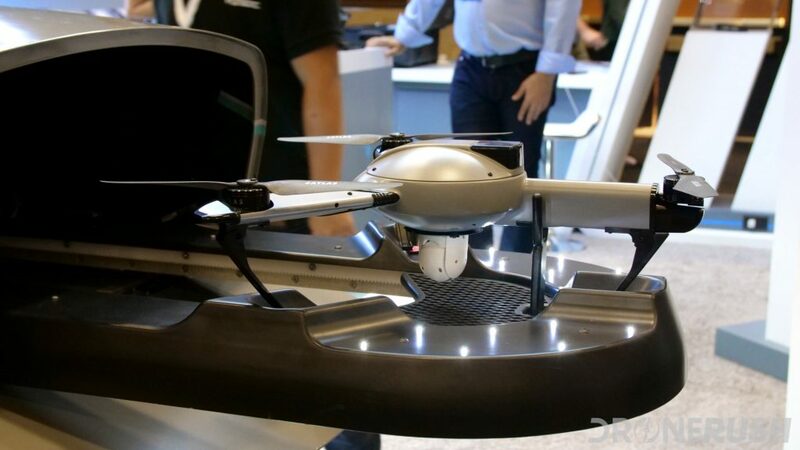 While there were few drones at the show that you and I will be buying at home, there was plenty of accessories to look at. More than the drones on hand, however, we watched a thriving and growing young market of new ideas for unmanned aerial vehicles. We left Vegas very excited for what comes next in the drone market. As I say, this may not have been the event you want to hit if all you want to do is buy a new drone to fly at home. Machines like the DJI Spark were not exactly the focus of this event. InterDrone brought together global leaders in the best that some serious players have to offer. If I had just one conclusion from InterDrone, it was that the systems behind a drone are more important than the drone itself. Intel, Yuneec and Atlas Dynamics explained this very well – the actual drone in the systems is cool, and important, but the ground stations, the programs that make the drone fly and then meaningfully process the collected aerial data are what really make the difference. 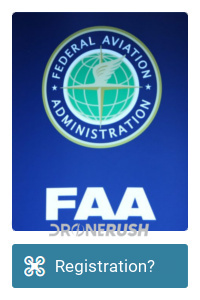 We really are excited to see what comes next from the overall systems, but then again, we think the best will come after the FAA allows more swarm and beyond line of sight flights. We’ve been thinking about this for two weeks now. 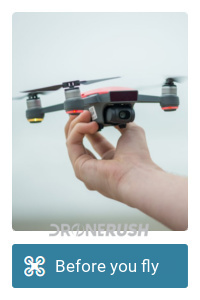 I think I could give my opinion of the best drone from the show, but what it really boils down to, there were three winners, with different focuses. 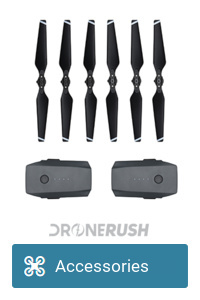 Let’s call them the Best drone, the Best consumer drone and the Best drone systems. 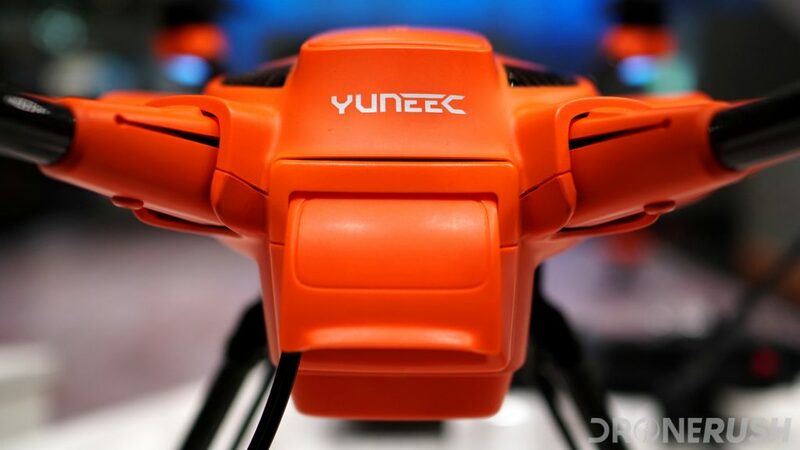 I’ve been in contact with Yuneec over this drone since January, a prototype was on display at CES and the system has been continually developed ever since. Officially announcing as available for sale just before InterDrone, the H520 is a commercial drone that outwardly looks like one of Yuneec’s consumer offerings. The Yuneec H520 is a powerful machine that flies very well, handles high winds nicely and is easy to control. The ST16s ground station remote control makes advanced flight operations, like a grid search or mapping services, fairly easy to setup, then it all but flies the drone for you. Interchangeable cameras make for various uses with the drone, early marketing and promotion suggest that inspection services are the key. We certainly were impressed by the accident reconstruction efforts in conjunction with the Nevada Highway Patrol. 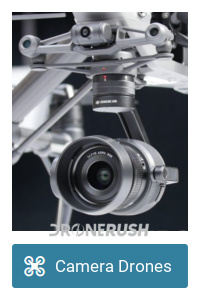 Bottom line, as far as a well rounded drone system goes, the Yuneec H520 is our choice for best of show from InterDrone 2017. 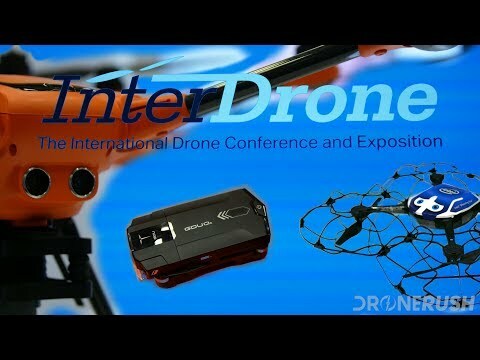 GDU came to the show in a big way, InterDrone 2017 was their launching point for the new GDO O2. This is a compact drone that has a neat trick, the propeller arms slide into the body for transport. There’s more, the drone snaps to the remote control as well, protecting the controls and the propellers while on the move. We must say, this is one of the best portable drones we’ve ever put hands on. 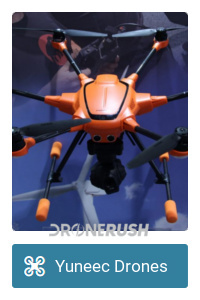 Not just at InterDrone, I mean one of the best, if not the best, on the market today. The purpose of the GDU O2, in our opinion, is as a moderately capable machine in a convenient form-factor and affordable price point. I still need to fly the GDU O2 for myself, but watching it in action, and holding it in hand, I believe it is the perfect machine to bridge the gap between the DJI Spark and the DJI Mavic Pro. All three are capable machines, but the Spark lacks a little in the camera department and the Mavic Pro is a little too pricey for some. 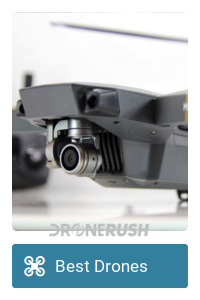 In terms of size, capability and price, the O2 sits between the two DJI products nicely. 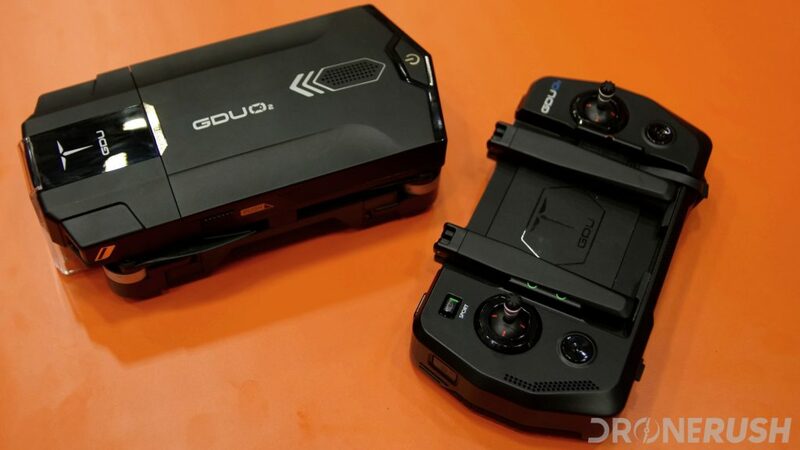 Stay tuned for more coverage of the GDU O2, we plan to get one in house for full review and comparisons soon. It should start shipping in the next week or two and you can grab your for $732. 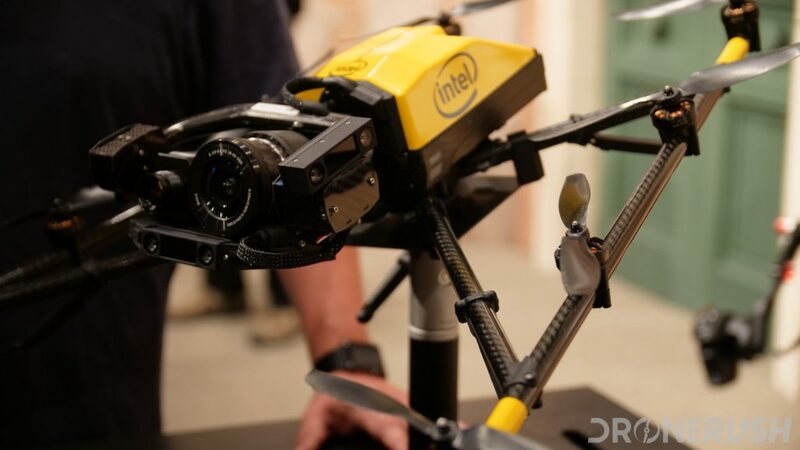 Intel has two major drone systems on the go right now. There is the entertainment system driving the Shooting Star drones that you’ve seen at the Super Bowl and Disney, then there is the commercial inspection and mapping driven by the Falcon 8+. The InterDrone opening keynote presentation included a live demo of the system in action. The Falcon 8+ drone flew twice, first by hand, then autonomously, to inspect a mock-building facade. This was a life-size fake building front a few stories tall, no games here. 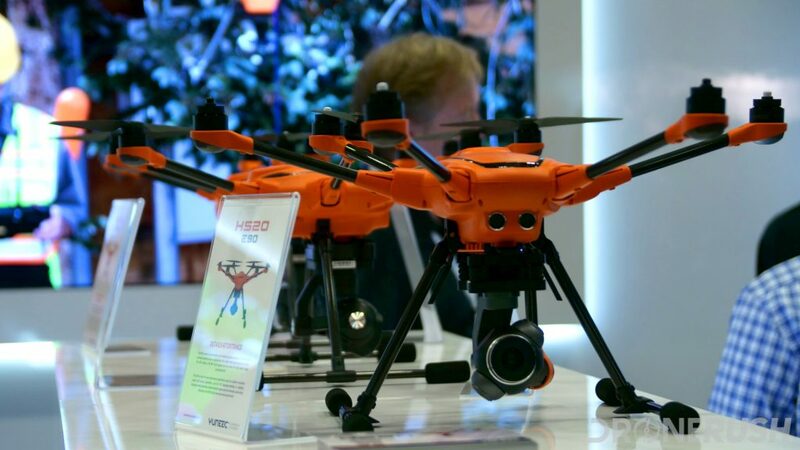 Flying indoors is difficult for most GPS navigated drones, relying heavily on the Intel RealSense visioning technology to prevent crashes and fly-offs. Actually, this is the first indoor demo I’ve seen that did not have a large crash net protecting the crowd. As it turns out, no net was needed, the demo went perfect. Or close enough as far I as could tell from the far side of the hall. A Falcon 8+ system will run you in the ballpark of $40,000 or more, or so the rumor goes. The real thing here, which goes beyond the drone at hand, Intel understands that the power of the drone is in the data it collects. 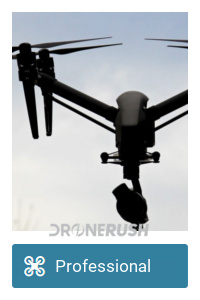 Aerial photographs and video are the focus for now, obviously. Stitching images together for a larger view of something, analyzing those images for anomalies and more may pave the way for improvements in our world. Consider this: many bridges are inspected a few times per year, the same goes for roadways and power lines. This is due mostly to a lack of manpower. A human looking at a bridge a couple times per year is far less effective than a monthly or more close-up inspection by drone. The importance here is that the drone images collected, using Intel’s new Insight software, can be automatically analyzed for you. The software will highlight any changes in the inspected infrastructure. In the live demo, things like missing pipe clamps and cracks in concrete were easily detected. A thorough inspection could reveal missing bolts and such. 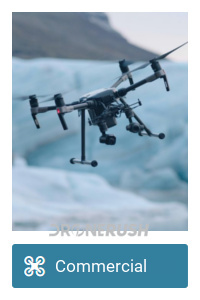 We understand that a drone inspection cannot currently replace a hands-on inspection by a human. However, adding these additional inspections on top of the human inspections could really make a difference. If nothing else, call it a pre-inspection that will help the human narrow down spots that need attention. 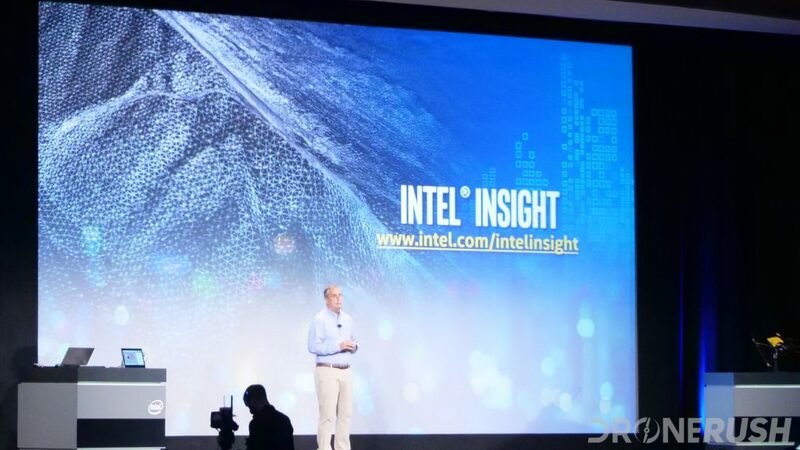 The Intel Insight software is a powerful application that can save hundreds of hours of human work. That is what technology is supposed to be for, right, to ease the workload on humans? There were many drones and vendors at the show. More than we can talk about today. Most all served unique purposes, but all provided insight into what is coming for drones around the globe. Starting with our youth, folks like Reza Karamooz, founder of GRADD and NVBAA, is running after-school programs for children to learn all about things that fly. I spent a long while chatting with Mr. Karamooz and one of his student interns. Few others in that entire convention hall were as enthusiastic and passionate about things that fly. If nothing else, it was fun to watch the children enjoy 3D printing small aircrafts, including a full Mavic Pro clone. 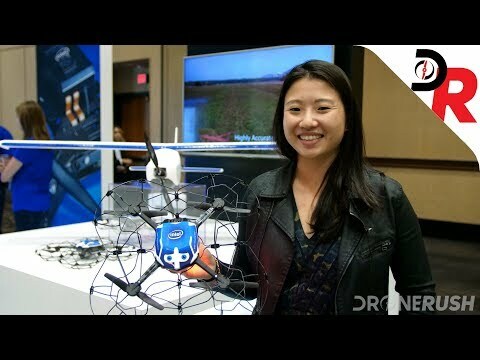 The same idea was at play from Atlas Dynamics, the Atlas Pro is a fun looking drone and system. 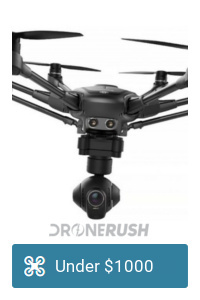 They make the drone themselves, but were hoping to find retailers and potential new markets for their machine meeting with folks at InterDrone. Best of luck to them, the Atlas Pro looks like a blast to fly. In the end, I encourage you to ask any questions you have in the comments below. Otherwise, know that the world of drones is just getting started, we will have so much more to explore in the next few years, I am glad you are along for the ride.